With a unique combination of leading-edge technologies, our skin revitalisation light-based treatments target all types of freckles leaving you with a clearer revitalised skin tone. What is a freckle and what causes them? Freckles are known as ‘sun kisses’ for good reason. Exposure to sunlight is one cause of the appearance of freckles, due to the sun’s action on melanin, a dark pigment in the skin. Freckles are inherited too and those with the chromosome 4q32-q34 will have freckles, just like their parents or siblings. Freckles appear as circular spots on the skin, darker in colour than the skin around them. They can range in colour from almost yellow, to black. Most are in the mid range of light to dark tan coloured. Ephelides freckles are ones that emerge during the summer, when the skin is exposed to sunlight. These freckles are light brown, and they will fade in winter. Lentigine freckles are much darker coloured, and do not disappear when the sun goes in. The types of freckle we treat most often are Lentigine freckles. Whilst some people love their freckles – and many people see them as highly attractive – others want to remove them. Treatment with high-tech lasers can be highly effective, reducing or eliminating freckles and leaving a smoother, clearer skin surface. If you have freckles that you want to remove, then laser treatments offer the best results in our experience. 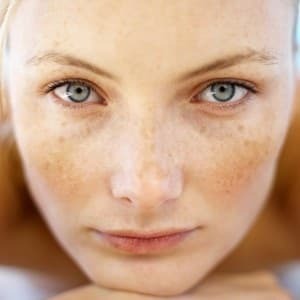 How does laser treatment work to remove freckles? We are able to offer the two most advanced types of laser for removing problem freckles: PicoSure Focus Lens Array and the RevLite. The PicoSure Focus Lens Array (FLA) is designed to microscopically concentrate the powerful energy of PicoSure on small areas of tissue. The FLA redistributes each PicoSure pulse into microscopic patterns of ultra-high fluence tightly focused regions, embeded in a low fluence background (see image). The laser energy, which is up to twenty times that of PicoSure alone, is absorbed by the freckles destroying the melanin, which leads to its removal. Furthermore, the laser has the shortest pulse (trillionths of a second) of any known laser. The production of high energy levels in this short period of time creates a photo-acoustic effect on the melanin in the freckles, literally shattering the pigment particles which are more easily removed by the body. We are the only clinic in the North of England fortunate enough to offer this revolutionary treatment. RevLite laser treatment involves the application of a particular light wavelength, which is absorbed by the pigment in freckles. 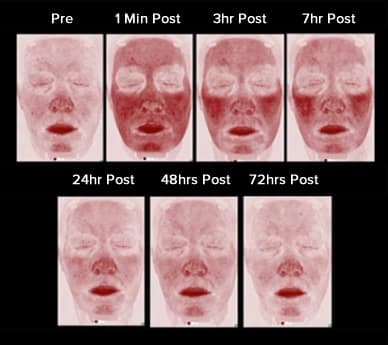 This light, known as PTP (PhotoAcoustic Technology Pulse), breaks up the freckle pigments, bringing the melanin to the surface of the skin, where it sheds as normal. 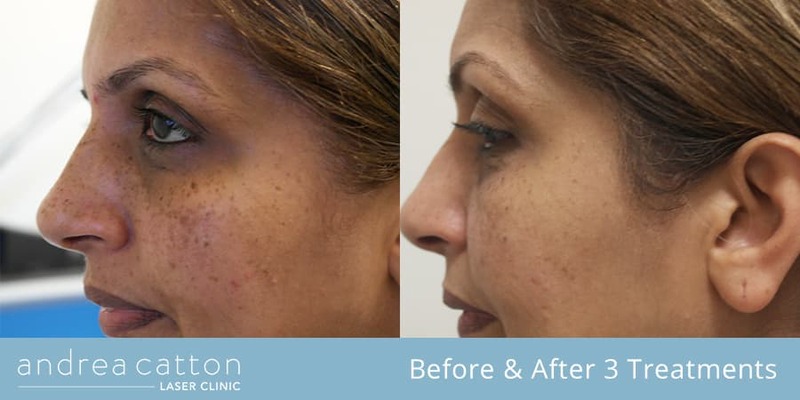 Results can be seen within 48 hours of your first treatment and over time you will see your freckles either disappear or lighten significantly, with a marked reduction in freckle pigment. RevLite treatment takes between 20 and 40 minutes depending on the size of the are being treated and PicoSure FLA treatments are much quicker, taking between 15 and 30 minutes. Immediately after treatment you will notice a reddening of the skin and a darkening of your freckles. The reddening will start to subside within three hours and over the following few days the pigmentation will rise to the surface of the skin and be removed via normal dead skin cell shedding. 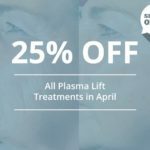 It is recommended you have laser treatment once a month and our consultants will be able to advise you on the number of treatments you will need for your desired results. 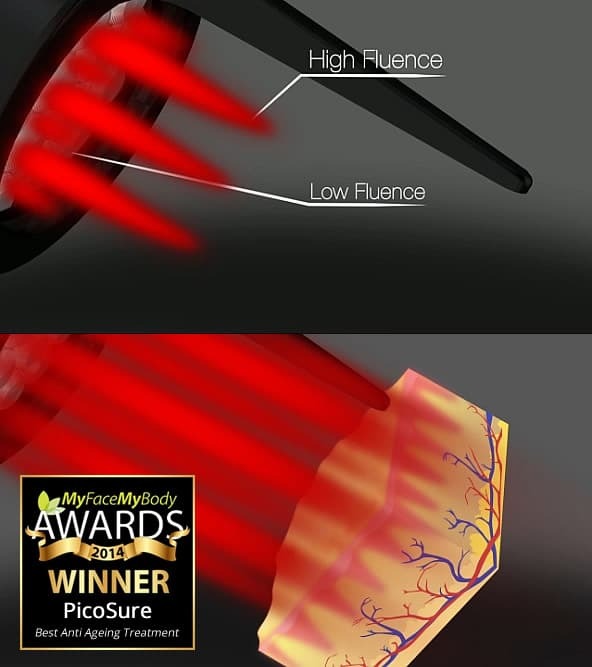 With the PicoSure FLA, you will undoubtedly see quicker results, due to the cutting edge technology it employs. Our clients report that the PicoSure FLA is the most comfortable laser treatment and has the quickest recovery times, making it our most popular laser treatment for all skin rejuvenation treatments including freckle removal. How much does laser freckle removal cost? If you would like laser removal treatment for freckles on areas of the body other than the face then you can send in a photo via our contact form here. 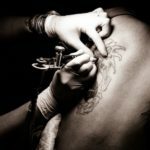 Consultations require a £50 deposit, which is deducted from any future treatments. 48 hour notice is required to move or cancel an appointment, or the deposit is forfeited at our discretion. What's the minimum age for laser treatment? The minimum age for laser treatments is 18 years. Depends on the size of the area being treated. Generally, treatment with the RevLite will take between 20 and 40 minutes and treatment with the PicoSure FOCUS Lens Array will take between 15 and 30 minutes. Your treated skin will naturally be a little red but this starts to subside within 3 hours. Click here to view a photo of how quickly the redness subsides. No time off work is required and you can resume your daily activities as normal. Anywhere between 1 and 10 as it depends on the individual and the laser used. The darker the freckles and the more of them, the more treatments required. If you’re after quicker results then we strongly recommend the FDA approved PicoSure FLA. One of our consultants will be to advise the number of treatments required more accurately during a consultation. A minimum of 3 weeks, both with the RevLite and the PicoSure FLA.